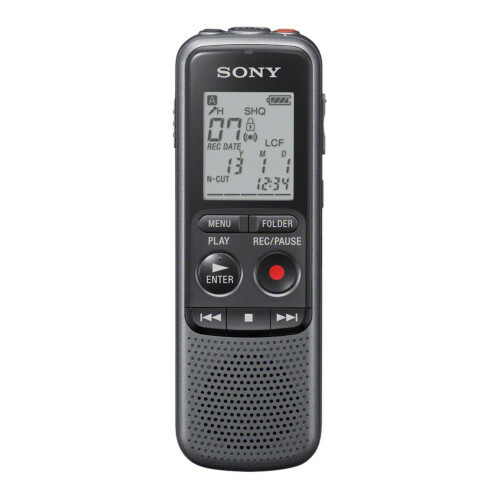 - 4 GB MP3 voice recorder with a built-in 300mW speaker. - Record MP3 audio and play it back through a 300mW speaker. - Long battery life enables up to 32hrs recording (MP3 8kbps). - 4GB of memory lets you store up to 1043hrs (MP3 8kbps). - Organise, protect, and delete files and folders. - Record memos, interviews, lectures, and more. - MP3 recording/playback - Capture high quality crystal clear audio, and listen back through the 300mW front speaker. - Recording time - Built-in maximum recording time memory of 1043 hours in LP mode (MP3 8kbps).